Economy Soars 5.7%, Fastest in 6 Years - Reuters - "The economy grew at a faster-than-expected 5.7 percent pace in the fourth quarter, the quickest in more than six years, as businesses made less-aggressive cuts to inventories and stepped up spending." Consumer Sentiment at a Two Year High - The Reuters/University of Michigan consumer sentiment index rose to 74.4 in January from 72.5 in December. This is the highest reading since January 2008, and breaks a string of five months with little movement. The index hit its low point in November 2008 at 55.3. Employment Cost Index Up 0.5% in 4th Quarter - The Labor Department reported that employment costs increased 0.5% in the fourth quarter. Benefit costs rose 0.5% and wages and salaries also rose 0.5%. For all of 2009, the employment cost index increased a record low 1.5%. The small increase was to be expected given the high unemployment rate and weak economy. Chicago PMI Rises - The purchasing managers index (PMI) for the Chicago region showed increased manufacturing activity in the Chicago region in January. The Chicago PMI rose to 61.5% from 58.7% in December. A reading over 50% indicates overall business expansion. This bodes well for Monday's ISM survey (Institute for Supply Management) for January. Where I grew up in Abington, Virginia, there was only one movie theater. Quite frankly, the theater wasn’t particularly nice and it always had a musty odor, but it was the center of our social lives almost every Saturday afternoon until I was about 10 years old. I vividly recall my father giving me exactly one dollar to last the whole day. In retrospect, it was a fairly inexpensive way for him to keep me entertained for the day. It cost twenty-five cents to get into the theater, and the rest of my money would quickly be spent on popcorn, candy and sodas. It was a kid’s dream come true! In those days, movies didn’t always start at specific times. That didn’t matter to me and my friends, though, because when we went to the theater, we were there for the whole day. It wasn’t unusual for us to arrive at the theater in the middle of a movie and watch it through several times throughout the day. The highlight of the day was the cartoons that were played for a few minutes in between features. I recall our gang of kids being a rowdy bunch. The audience was often louder than the films on-screen; since almost everyone had already seen the movie at some point earlier in the day, we were usually more interested in talking to one another than paying attention to the movie. Life was simpler back in those days. Until I was about 10 years old, that’s how I spent almost every Saturday. After then, my Saturdays were consumed with outdoor athletics except for when the weather was bad, which is when I went to the bowling alley. At the age of 12, on one of the few occasions I went to the movie theater anymore, I discovered the balcony (but that story is for another day). It’s funny how your interests change as you grow older. I still enjoy movies, but there’s no way I could sit in a movie theater watching the same film over and over all day long. 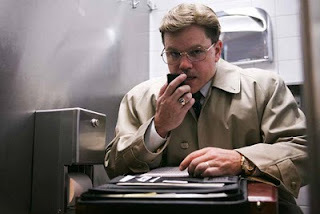 This past fall, I went to see the movie, “The Informant!” starring Matt Damon. The film was based on the book of the same name by investigative reporter Kurt Eichenwald, and was about Mark Whitacre, a high-level executive at Archer Daniels Midland who became an FBI whistleblower regarding ADM’s price fixing schemes. Ironically, Whitacre ultimately spent eight and a half years in prison for embezzling $9 million from the company during the time he was an FBI informant. Although I knew nothing about the story before seeing the movie, it seemed highly fictionalized. First off, Matt Damon’s character was very low-key and it didn’t seem possible for anyone in the business world to be so brazen. After the movie, I bought Eichenwald’s book to find out the full story behind Mark Whitacre. However, because of the hectic holiday season, I wasn’t able to get to it until this past weekend. The book was over 600 pages, but it was so compelling that I read it entirely over two days. If I didn’t know this was a true story, I would’ve thought it was an incredible work of fiction! It reads like an international spy novel, but it’s almost stranger than fiction. Furthermore, it’s even more incredible how Whitacre went from being a hero to a villain over the course of three years. I want to provide you with a brief synopsis of Mark Whitacre’s story, but I highly recommend you read The Informant! yourself to get the elements of espionage and humor that made it such a page-turner. Whitacre worked as President of the BioProducts Division at Archer Daniels Midland (ADM) from 1989 to 1995. ADM is a major publicly-traded company that specializes in agricultural products. The company is very well-known and influential in the agriculture sector. In the early 1990’s, ADM complained that they were the victim of corporate spying from one of its competitors. The FBI came in to investigate, and during their investigation, Mark Whitacre privately alleged to an FBI agent that he and other ADM executives were involved in a multi-national price fixing scheme. ADM was apparently in cahoots with domestic and international companies to fix a minimum price for agricultural commodities. After making the price fixing allegations, Whitacre became the highest-level executive to ever become a whistleblower in U.S. history. Whitacre’s intentions, however, were misguided, as his goal was to be named the President of ADM. However, his cooperation with the FBI was the reason they were able to recover over $1 billion in fines from ADM and other involved companies regarding the scheme. Additionally, ADM paid millions more to customers and plaintiffs of class action cases. It’s likely that you’ve heard of the well-publicized Nigerian $25 million advance free frauds, where the target receives a letter from a Nigeria who attempts to persuade them to advance a significant amount of money with the promise of receiving a large gain in return. I can recall receiving these letters for at least the last 25 years, often receiving two or three per month. I never took them seriously, though. According to the FBI, Mark Whitacre’s motive for embezzling from ADM was because he had been scammed, and that the losses he suffered in the Nigerian scam – over $400,000 – may have been the initial reason behind his embezzlement activity. While Whitacre cannot be classified as unintelligent – he has a PhD and was the President of a major division in an international company – he certainly was naïve. The FBI asserts that Whitacre’s original attempts to embezzle funds from ADM were for the purpose of recovering his losses from the Nigerian scam. This further illustrates just how bizarre this case is in the corporate scandal world. Mark Whitacre was sentenced to 10 years in a federal prison camp, but served only eight and a half years for good behavior. He and his wife became born-again Christians, and he is currently the President of Operations and Chief Operating Officer at a biotechnology firm in California called Cypress Systems. In short, I highly recommend both the book and the movie. The book is more in-depth than the movie, but both are very entertaining. It’s a look into a part of the corporate world that most people never see, and it’s fast-paced and darkly humorous. The moral of the story? No good deed goes unpunished. IMF Projects Stronger Recovery - The International Monetary Fund (IMF) released their latest economic projection Tuesday that stated that the global recovery has been stronger than expected but financial stability remains fragile. In the world's largest economies, the recovery is expected to remain sluggish and there is little evidence of demand not driven by government stimulus. In numerous emerging economies though, activity will be relatively vigorous. Due to the fragile nature of the recovery, "fiscal policies need to remain supportive of economic activity in the near term." Additionally, there continues to be the need to repair the financial sector with an added risk that public debt issuance in coming years could crowd out private sector credit growth. Consumer Confidence Rises to a High - According to a survey released Tuesday by the Conference Board, the consumer confidence index rose to 55.9 in January from an upwardly revised 53.6 in December. The 55.9 reading is a 16-month high. The improvement in January was due mainly to better feelings about the present situation with consumer expectations and labor market assessment improving slightly. Home Prices Fall 0.2% in November - According to the Case-Shiller home price index released Tuesday by Standard & Poors, home prices in 20 major US cities fell 0.2% in November versus October non-seasonally adjusted. Overall, prices are down 5.3% in the past year according to S&P. Five of 20 cities saw higher prices in November versus October. On a seasonally adjusted basis, prices rose 0.2% in November. Budget Deficit to hit $1.3 Trillion in 2010 - CBO - The Congressional Budget Office (CBO) estimated that the US budget deficit will hit $1.3 trillion in 2010. President Obama in response has called for a 3-year freeze on certain domestic spending that could potentially save $250 billion over 10 years - read more at Obama to Seek Three-Year Freeze on Domestic Spending - Reuters The Congressional Budget Office's estimate assumes current laws and policies remain unchanged. Economic growth will also probably be "muted" for the next few years, the CBO said in its budget outlook for 2010. On Thursday, the U.S. Supreme Court ruled that the government cannot ban political spending by corporations in candidate elections. Basically, the ruling overturned laws in place that the government must dictate the contributions of corporations and labor unions in political elections. The majority opinion was that these laws were unconstitutional in that they violated the most basic free speech principle under the First Amendment – that the government has no business regulating political speech. The dissenting justices said that allowing corporate money to flood the political marketplace would corrupt democracy. The Supreme Court was created to decide these issues so that politicians could not violate constitutional requirements. If Congress wants to change the constitution, then it must follow the rules. The most recent Supreme Court ruling in the case of Citizens United v. Federal Election Commission overruled The Bipartisan Campaign Reform Act of 2002, which was signed into law by President George W. Bush. At the time that President Bush signed off on the Act, he had reservations about the constitutionality of the broad ban on issue advertising, but taken as a whole, he felt that the bill improved the current system of financing for federal campaigns. In my opinion, he was right to be skeptical on that issue. The irony of that statement is overwhelming. First, the case at issue related to a documentary about Hillary Clinton (“Hillary: The Movie”), which was released in 2008 during the Democratic presidential primaries. The Supreme Court basically said that the constitution protected even people who wanted to produce negative campaign films with their own money. I really do not see how anyone could argue with that position. The other interesting part of President Obama’s statement is that he didn’t mention the labor unions. The largest concentration of money spent in the 2008 Presidential election was expended by the labor unions and by a political action committee sponsored by George Soros, MoveOn.org. Ironically, the labor unions and MoveOn.org only sponsored one candidate, President Barack Obama. The only reason any sitting administration would want to resist free access to campaign contributions is because they want to control the media. The only way that Congress will ever be able to reform campaign contributions is by an amendment to the constitution. The ability to advertise gives all candidates the opportunity to be elected. Otherwise, the incumbent has an enormous advantage over any challengers. Thank goodness the U.S. Supreme Court has protected all of our interests rather than just the special interest groups which do all the campaign advertising now. It seems like once a week, the current administration finds a new tax to put on businesses. This reminds me of the old movie from when I was in college, “If it’s Tuesday, This Must Be Belgium,” a silly film that centered on a group of tourists on a motor coach tour of Europe where they visited a different country every day of the tour. If you’ve ever been on a European tour, I’m sure you can relate; when you wake up in the morning, you’re not quite sure which country you’re in that particular day, but it starts just like every other day before it. Almost every week, I get the same experience when I see the Obama administration proposing a new tax or a new regulation that will hurt the U.S. economy rather than help it. Last week I wrote about the Wall Street Debacle and President Obama’s proposed “Financial Crisis Responsibility Fee” (Wall Street Debacle – Was It Really Greed? and “We Want Our Money Back, and We’re Going to Get It”). This week, I want to discuss the new regulations proposed on banks. What’s so interesting about these populist proposals by the administration is that there’s almost no chance that any of them will pass Congress. Even if they did pass, which is highly unlikely, they would have very little effect. I’ll try to explain why in today’s post. I can’t help but think that in some regards, all of these new proposals are a smoke screen to cover up the other issues that now appear to be dead. As I discussed in my January 21st post (“The Health Care Bill is Officially Dead”), the proposed health care reform as written is completely dead. Even though we’ve not had the eulogy on the “Cap and Trade” legislation, it is also dead. A title of “Cap and Tax” would’ve been more appropriate. Even though no one can argue the importance of saving the environment, the worst way of doing so is by regulating every piece of business in America with a new, prohibitive tax. Of course, the smoke screen is most prevalent on the economy, where the stimulus act has been an incredible failure and unemployment continues to be stubbornly high with no relief in sight. I suspect that in President Obama’s State of the Union address next week, we will hear a lot of rhetoric concerning his attempt to get the federal deficits under control. As evidenced by the result of the Massachusetts Senatorial election, that is the number one issue on the minds of America. If Obama really wants to deal in populist politics, then he must address the deficits at some point. There is no more important time than now for him to do so. I’ve written extensively on the TARP and the positive benefits it brought to the financial system in America in 2008. I’ve also pointed out that all the major banks in America have now repaid their TARP loans with significant interest and a premium for their options. The banking industry has done their part to make the TARP whole, even though they continue to be the whipping boy for new taxes in America. The reason I point this out is because the current administration continues to use TARP money for pet projects that have nothing whatsoever to do with the financial stability of the banking industry. As you recall, the TARP was specifically restricted for the purpose of the financial institutions, and by law, dictated that when the money was repaid to the TARP, that it must be refunded to the federal government. However, that didn’t prevent the current administration from using the money for massive bailouts in the automobile industry and for AIG. Even though neither of those companies were financial institutions, it was clear that the money was used for purposes other than what it was intended. U.S. Secretary of the Treasury, Timothy Geithner, recently announced that the need for the TARP was over. He said that the financial controls were now in place and the banking industry was stable. In spite of that, the Senate took a vote yesterday about whether or not to wind down the TARP and return all the unused money to the Treasury to reduce the deficit. The Senate voted 53 to 45 to close down the TARP, but the provision failed since it did not have 60 votes. The purpose of this is to point out that even though your representatives give lip service regarding deficit reduction, it is absolutely clear that they intend to use the rest of the TARP money for their own pet projects. Mark my words that you’ll soon see the balance of the TARP money being spent for pork barrel projects that will do nothing to help stimulate the economy. In essence, the new stimulus money will be designed to bailout the old stimulus money, which has been a categorical failure. Yesterday, the Dow Industrial Average went down 2% after President Obama’s speech wherein he proposed new regulations on the major banks. That was a classic case of “speak first, think later.” Reports of earnings for this quarter have been spectacular – we’ve seen sterling earnings reports from IBM, Intel, McDonald’s, Google, Goldman Sachs, and J.P. Morgan Chase, among others. Given the current economic environment, earnings have truly been incredible. Even with yesterday’s loss, the market is still up for 2010. It seems strange that the market would react so adversely to a proposal that, as I will demonstrate, will likely be meaningless. Congress recently asked Secretary Geithner whether proprietary trading had anything to do with the financial meltdown in 2007 and 2008. He responded that proprietary trading had virtually nothing to do with the meltdown; rather, it was due to poor lending habits. Duh?!?! Why would new regulations be proposed if that wasn’t the problem? I find it interesting that the current administration continues to blame the large banks for the financial meltdown when they didn’t even cause the problem. The source of the problem is clearly traced to the sub-prime lending market that Congress basically created. Congress forced Freddie and Fannie to provide the sub-prime loans that ultimately led to the financial meltdown. Every problem that we can identify today regarding the financial meltdown is traced to the sub-prime loans created by Freddie and Fannie, which were ultimately syndicated by the brokerage houses and sold into the public market. In spite of that, none of the current administration’s proposals have anything to do with regulate the real bad guys – Congress, Freddie and Fannie. It seems that since our representatives cannot take responsibility for their own failures, they’ll simply find someone else to pin the blame on. Isn’t it interesting that combined, Freddie and Fannie have lost a staggering $250 billion over the last three years. It’s also interesting that Freddie’s former CEO walked away with a total compensation package of close to $90 million when he left to join the administration. I find it incredibly confusing that the presidents of both Freddie and Fannie each received annually bonuses equaling $6 million for 2009, when they lost a combined $50 billion for 2009. No one complained about their compensation. Why? On Friday, Congressman Barney Frank recommended that Freddie and Fannie be eliminated in its current form – a very good start. It seems that Congress has its focus on all the wrong people in this matter. Rather than the major banks being the problem, it was Freddie and Fannie, the auto companies and AIG, and they are not being assessed new taxes or new regulations. Philosophically, who wouldn’t support the proposal as advertised? It’s doubtful anyone would support money that carried a government guarantee being utilized by the financial institutions that would then use those funds for proprietary trading or high risk taking at the government’s expense. However, that’s not occurring now anyway. The four major banks in the United States that have government-guaranteed deposits are Bank of America, J.P. Morgan Chase, CitiBank and Wells Fargo. When I say “government guarantees,” I mean FDIC insurance on the deposit accounts in these major banks. As reported by The Wall Street Journal, of these four banks, Bank of America has 1% of its total revenues in proprietary trading accounts. Likewise, J.P. Morgan Chase has only 1% of its companywide revenue in proprietary trading accounts. Wells Fargo has no proprietary trading accounts at the current time, and only CitiBank (which is 30% owned by the U.S. government) has 5% of its revenues in proprietary trading accounts. Because of President Obama’s speech, all of these stocks except Wells Fargo took a major beating on Thursday. This happened even though the purpose of the proposed regulation is moot because these accounts are basically a non-existent portion of the banks’ annual revenues. The fear isn’t this particular item; rather, investors are concerned with what other types of regulations the government may institute that will bog down banking and prevent them from loaning to businesses that need money to expand and increase employment. There are only two remaining Wall Street firms – Morgan Stanley and Goldman Sachs, which represent the only true brokerage houses left in the U.S. Only 5% of Morgan Stanley’s gross revenues and 10% of Goldman Sachs’ revenues are in proprietary trading accounts. Interestingly, neither of these firms takes customer deposits, and therefore, they do not have government guarantees on their accounts. Each owns a very small bank in order for them to qualify for federal banking protection, and it would be easy enough for them to sell those small banks to avoid all the regulations being proposed. As for the four major banks discussed above, each of them has brokerage divisions. It would be easy for them to reposition the proprietary trading accounts into their brokerage divisions and avoid the proposed regulations. As such, even though the administration made a big deal yesterday regarding these proposed regulations, from an economic standpoint they mean absolutely nothing. Again, the concern is what these types of regulations ultimately lead to in our economic landscape. As I think will be demonstrated, the Congress today is less in the mood to restrict business since they need to stimulate employment. Given that they’ve wasted an entire year with proposed legislation that will not pass and which would have hurt business and employees, such as health care and Cap and Trade, now is the time for them to do something worthwhile. I wonder if we could get through a few weeks without the current administration proposing a new tax or a new regulation that would hurt employment rather than improve it. It seems to me that the focus should be entirely and completely on increasing employment, but 12 months into the new administration, it appears that employees have been totally ignored. It appears that the massive Congressional bill to reform America’s health care system is now dead as a doornail. As of Wednesday, President Obama has indicated that there are portions of the bill that he feels everyone can agree on and can be passed, which is exactly what Congress should’ve done in the first place. They simply should have passed the sections regarding no exclusions for pre-existing conditions, free transferability of insurance, and no policy maximums now and then took the time to hammer out the rest of the bill over the next few years. Most of the items that so many Americans find to be harmful and controversial will just have to wait. I think most Americans would support reform in those particular areas of our current health care system. But to try to rush through a bill in less than one year that will totally transform one-sixth of the American economy was unwise from the beginning. Hopefully the provisions that most people actually support will now be passed and a study of the underlying problems with the rest of the bill will be performed. If we could actually save some money in these entitlement programs, it would certainly be beneficial to our ballooning federal deficit (which is already setting monthly records signifying ineptitude). The federal government spends $120,000,000,000 (that’s $120 billion) a month more than it takes in, so any form of savings would be welcome. It should be clear even to the novice observer of the federal budget that this type of incredible deficit spending cannot continue. The simple answer to why banks aren’t lending is because they don’t have to. Banks, like all other businesses, are required to make profits. In order to answer to their regulators and their shareholders, banks must be profitable or they cease to exist. Until banks are required to lend to make a profit, they will simply elect to do otherwise. That’s exactly what is happening today. There are two very effective ways for the government to assist banks in becoming financially sound. One way is to directly fund them, which is what was done under the TARP. However, contrary to the public’s popular belief, the TARP wasn’t a profitable venture for the banks. Since they were required to pay 5% to the government and deal with mountains of bureaucracy, it made more sense for them to repay their TARP loans as quickly as possible. There are now no major banks that continue to have TARP money in the United States. It was much more profitable for banks to use their deposits and issue new stock than to deal with paying the 5% to the government while dealing with the insane governmental procedures. The other effective way to help the banking industry get in a better financial position is to allow them to make more money. If money is made available to the banks at a cost of almost zero, it shouldn’t be difficult for a bank to invest at a higher rate and keep the spread as its own income. Today, banks can borrow from the Federal Reserve at close to zero. This allows banks to buy 3% tax exempt bonds, and make almost a three percentage point difference while paying no income tax on the income earned. Why would a bank ever want to loan money to a customer who might not repay them when they can make almost 3%, tax exempt? I have recently approached several banks requesting loans for several of my clients. In prior years, banks were practically doing back flips trying to get the business of these very same clients. In almost every case, each bank told us of their impressive bank capabilities and how anxious they were to assist new customers in new and exotic loan programs. They would take up an enormous amount of my and my clients’ time, but in the end, they would always decline to extend the loan for reasons that often made no sense. The bank’s decision never had anything to do with the particular client; rather, it had everything do with their reluctance to loan money to anyone when they were making a good rate of return without taking on the risk of potential bad debts. My forecast is that within two years, each and every one of those banks, if they are still in business, will start doing back flips once again to loan these same clients money. Do you find yourself wondering why interest rates are this low? It seems like banks are just telling us they don’t need our money, because they have all the money they need and they can simply borrow it from the government at such a low rate. The bank’s principal cost of operation is what they pay for the money they borrow from you (CD rates). The foregoing CD rates indicate that the government is now providing all of the capital banks need. Therefore, CD rates continue to plummet. Sadly, the CD market is one of the only ways some older people feel they can safely invest their assets. It is unfortunate that they have to bear the brunt of these low interest rates, since it adversely affects their cash flow needs in retirement. It is not possible for someone to have a positive rate of return with a 5-year CD rate of 2.23%. If you don’t believe that the inflation rate over the next five years will average higher than 2.23%, then I’d be happy to sell you some beachfront property in Valdosta, Georgia. If inflation does as I project, every year you will lose money against the rate of inflation. After reviewing the dismal interest rates currently being offered on CD’s, I’m baffled by the fact that people continue to invest in them. I’ve never understood the investing philosophy of investing in cash assets when rates are so low. First and most importantly, the low interest rates on CD’s are taxed at the maximum individual income tax rates. Next year, those income tax rates are likely to be as high as 50%. There are no tax incentives whatsoever to earning interest and, certainly, there are no interest incentives. However, you could own some individual stocks in virtual monopolies where dividends are many times the rate of interest. For example, you could receive the following returns on these stocks: AT&T – 6.5%, Verizon - 6.2%, Duke Energy - 5.7%, Southern Companies - 5.2%, Consolidated Edison - 5.2%. As you can tell, you can get a dividend yield at greater than 5% for these virtual monopolies with an extraordinarily favorable tax rate. How investors make the decision to invest in cash when they could buy these equities will continue to baffle me. Here’s my solution to the entire banking problem we’re experiencing today. To make banks start lending money again, the interest rates that the banks must pay should be increased by the government. If the Federal Funds Rate was increased today, banks would immediately need to seek ways to make higher rates of return on their capital. In order to earn those higher rates of return, they would have to begin loaning money again to businesses and individuals. Why should a bank make a mortgage to anyone in today’s environment? For any loan below $417,000, banks can turnaround and syndicate it to Freddie and Fannie for a fee of three-quarters of 1%. Basically, the bank would originate the loan, sell it to the quasi-government agencies, take a fee for its trouble and never have the risk of collecting on the debt. One other way to force the banks to start lending again is to make Freddie and Fannie quit purchasing every mortgage made in America today. Let’s get back to the banks actually loaning money to customers they know! Have you noticed that it’s nearly impossible to obtain a jumbo loan nowadays? If you needed to borrow money above $417,000, it’s much more difficult than ever before. The reason, of course, is because the banks cannot as easily syndicate jumbo loans to third parties. As such, they typically elect not to make these loans rather than run the risk of not being repaid. If the banks couldn’t invest their money at such a valuable spread between the cost of money and the cost of their risk-free investments, they would have to loan this money in order to be profitable. I recently blogged about how absolutely out of control Washington is these days and how out of touch they are with the American public. There seems to be some sort of agenda in Washington that defies logic. Most everyone, including me, thought that a stimulus plan was a good idea to get the economy back on its feet. However, the stimulus plan that was ultimately passed has done little, if anything, to improve the economic landscape. Employment can’t be increased when money is being given to state governments to keep bureaucrats on the payroll that should’ve been long gone. Additionally, while extending unemployment benefits to people who’ve been laid off is an honorable cause, it does nothing to increase employment; it only costs the government billions of dollars without providing immediate results. Now, we are being told that the bulk of the stimulus money will not be spent until the end of 2010, at which point it will probably not be needed. In order to increase employment, you must stimulate small businesses and encourage banks to lend. Our government today is not doing those things. The most recent numbers illustrate the incredibly irresponsible budget in Washington. The federal budget deficit was $91.85 billion in December alone. December is historically a positive month due to year-end tax payments by corporations, etc. However, this year it was a major negative number. For the first three months of fiscal 2010 (which began on October 1, 2009), the budget deficit was a whopping $388.51 billion. You may recall that when the stimulus package was passed, we were told that it would help get unemployment down to 8%, yet even today it’s still above 10% one year later. The George W. Bush administration ran a deficit total of $454 billion in fiscal 2008. It seems the current administration will exceed that fiscal deficit in the first four months of the current fiscal budget year. Suffice it to say that the gross incompetence in Washington is staggering. On Tuesday morning, a special election was held in Massachusetts for Ted Kennedy’s U.S. Senate seat, which was left vacant after his death. It’s highly likely that Scott P. Brown, the Republican challenger to the Democratic candidate, Martha Coakley, will win. I think the outcome of this election will demonstrate the taxpayers’ distrust of our elected officials. Even though Massachusetts has the reputation of being one of the most liberal states in America, the polls are showing that Mr. Brown has a good chance of winning the election. During Mr. Brown’s campaign, he promised he would vote against the proposed health care legislation, which would be enough votes against the bill to block it with a filibuster. Mr. Brown is against higher taxes and bigger government. The public is also against higher taxes. That’s why he has a chance to win in Massachusetts. If this terrible health care bill is, in fact, stopped in its tracks, then perhaps governmental spending will finally be restrained. It’s hard to believe that our representatives are willing to pass legislation that would essentially nationalize one-sixth of the U.S. economy even though close to 60% of the U.S. population thinks it’s bad for America. In the next few weeks, I think we’ll find out how low our representatives are willing to go to pass this terrible legislation. The economy can be improved by decreasing taxes rather than increasing them. The last thing the economy needs is a new trillion dollar tax to pay for health legislation that the vast majority of Americans think is unnecessary, wasteful and harmful to our economy. The banks cannot be forced to lend until we increase their cost of borrowing. It would be a mistake to tax the banks, as it surely would not spur them to lend. The new bank tax proposed by President Obama is just about the worst idea to try to get them to increase lending. This tax is levied on the liabilities of the banks, encouraging banks to reduce lending, not increase lending. There just seems to be a complete disconnect in Washington when it comes to improving the economy and improving our daily lives. Hopefully, the rest of the nation will catch on that the only way to get Washington under control is through the voting booths. Everyone should want what took place at the end of President Clinton’s first two years in office. Due to the overwhelming Republican takeover of Congress in 1994, Washington was almost evenly divided between Republicans and Democrats. The absolute best thing that could possibly happen for the economy and for the stock market was in motion – eight wonderful years of Congressional gridlock. We had the best economy in decades, and the stock market was fabulous. In conclusion, in November, you shouldn’t vote for candidates to send to Washington – instead, vote for gridlock! Postscript: I wrote the above post the morning of Tuesday, January 19th. As I’m sure all of you are aware, the Republican candidate, Scott Brown, won the Senate seat in Massachusetts over Martha Coakley with 52% of the votes (Coakley had 47% of the votes). This was a landslide victory – perhaps not by percentage points, but by the historic importance of this election. Massachusetts has not elected a Republican Senator since 1972. More importantly, it now eliminates the supermajority from the U.S. Senate, and therefore, changes the legislative landscape for years to come. It will be very interesting to see if the Obama administration attempts to negotiate a favorable settlement of the health care bill or if they just bow their backs and ram it through the Congress, even over the objections of most Americans. With the above proclamation, President Obama proposed a new $90 billion bank tax on January 14th , called the “Financial Crisis Responsibility Fee.” It’s unfortunate that President Obama’s memory is hazy on the facts; perhaps it’s time that’s he’s reminded. It’s obvious that President Obama doesn’t heed my advice, as he continues to propose more and more taxes. At the very least, the information he relays to the public needs to be accurate. In the meantime, I will provide you with the facts so you can judge for yourself if his newest proposal is appropriate. Originally, the TARP disbursed approximately $245 billion in connection with the Emergency Economic Stabilization Act of 2008 (“EESA”). It was estimated at the time that the TARP would lose $76 billion in connection with these investments. As of December 31, 2009, the TARP has been repaid $164 billion of the original amount plus interest, leaving approximately $78 billion unpaid. Even though the plan was projected to lose $76 billion, it has actually generated a profit of over $16 billion for the Department of Treasury as of the end of the year. The bulk of the money that hasn’t been repaid comes from General Motors, Chrysler, GMAC and AIG. None of the major banks have any unpaid TARP money at the current time. Therefore, President Obama’s assertion that the Treasury needs the money back from the major banks that they want to tax is not supported by the facts. I had been wondering what companies supposedly have not repaid their TARP funds and if there were any major banks on that list. My analysis of the proposed tax revealed some interesting information. This new tax will hit the largest major banks first, like J.P. Morgan Chase & Company. Without question, J.P. Morgan Chase is one of the best-managed banks in the entire world. They never requested TARP money, nor did they ever lose money during the financial crisis of 2007, 2008 and 2009. J.P. Morgan Chase is so well-run that arguably, they could loan the Treasury money. The only reason that J.P. Morgan Chase took the TARP money in the first place is because they were required to do so by the government and to be a good citizen. They have stated publicly on numerous occasions that they didn’t want the TARP money and wanted to pay it back immediately. It was only at the government’s insistence that they participated in the transaction. However, based on President Obama’s proposed tax, J.P. Morgan Chase would be assessed the largest tax -- $2.46 billion. Why on earth would the government punish one of the best-run companies in the world? Here’s exactly what I think is going on: The U.S. government loaned General Motors and Chrysler approximately $50 billion. Neither of these loans fell under the original TARP plan; they were extended solely for political reasons and there’s a highly likelihood the loans will never be repaid. Therefore, in order to repay the taxpayers the money the government thinks they’ll lose, they will instead tax the banks that have already repaid their TARP money (including interest and the purchase of warrants). Does this seem logical to you? The government has yet to mention the $200 billion and growing amounts that were loaned to Freddie and Fannie. The government’s funding of these quasi-governmental agencies that too often loans money to people who do not have the ability to repay the loans is quickly becoming a black hole. As has been clearly documented in numerous articles, many of Freddie and Fannie’s losses are directly attributable to Congress’ meddling and forcing these agencies to loan money to people who couldn’t afford to repay it. However, it wasn’t mentioned anywhere in President Obama’s announcement on Thursday how these agencies will be taxed to repay their loans. Only the banks that have repaid their loans plus interest will have to pay the new tax. Duh?!?! I’ve become a little cynical in regards to the President’s outrage concerning bonuses being paid to the major banks. First, I don’t think it’s the government’s place to define what companies should pay in salaries and bonuses. Furthermore, if you’re a shareholder in one of those banks and you don’t agree with what the executives are being paid, then you should sell the stock. For instance, I don’t see any public outrage concerning how much Jay-Z and Beyonce earned last year – a cool $75 million – many times what Jamie Dimon of J.P. Morgan Chase earns. Are people outraged at the $50 million Oprah Winfrey made in 2009? What about Tiger Woods’ income of $50 million? Tom Cruise’s $50 million? Alex Rodriguez’s $25 million? Is there some argument that the people running the major banks in America are not as deserving as these celebrities? I’m not concerned with the amount of money these people make. Likewise, I don’t think it’s the government’s place to be intervening into private businesses and dictating guidelines; that’s for the marketplace to decide. When we get to the point where our government decides what is appropriate for people to be paid, then there will be no more private industry in America. On Thursday, the Obama administration made a deal with the labor unions that their health insurance programs would not be taxed at the 40% level on Cadillac-type health plans. Everyone else in America, however, will be taxed. Therefore, not only will we have to pay additional taxes to pay for all the people in the U.S. who elect not to have health insurance, but we will also have to pay for Nebraska’s Medicaid taxes in perpetuity. We will also have to pay additional health insurance premiums in order to pay for the Cadillac plans that the unions receive. However, if you have such a plan, you will receive no exemptions and you will be forced to pay the 40% tax. This means that the government has cut a deal with Nebraska to buy their vote, they’ve cut a deal with the unions to buy their votes, and they’ve also cut a deal with all of the municipal and state employees to buy their votes. Just so you understand the magnitude of the issue, I’m going to give you the number of Americans who’ll receive exemptions under this supposed new health care proposal. At the current time, only 12% of U.S. workers are covered under labor union agreements. This means that 12% of Americans receive a special exemption under this new health care proposal and 88% of the U.S. population does not. Remember that there’s nothing currently in this new proposal that does anything to reduce health care costs. The only health care reduction proposal was the tax on the 40% Cadillac plans. Now, 12% of the population is even exempted from those restrictions. Of the 50 states in the United States, only one receives a Medicaid exemption forever – Nebraska. That means the other 49 states must pay for Nebraska’s Medicaid bill for eternity. I have no idea how this isn’t a Constitutional violation. If you voted for President Obama and do not have a special deal under the bill, you must really feel left out! The Financial Crisis Responsibility Fee can be summarized as follows: First, the government forced GM into bankruptcy and violated the basic bankruptcy law from day one – the government awarded one-third of the company’s stock to the labor unions for their support of President Obama. Political payback? Let me be clear that the company’s stock is going to the labor unions, not to the employees of GM. The creditors of GM are basically told, “tough luck,” which is in violation of the U.S. bankruptcy code. The taxpayers then loaned additional money to General Motors, GMAC and Chrysler, none of which are banks. Since General Motors is historically poorly run with costs that are way too high, there is little chance that they will ever be able to repay these loans. In order to ensure that the taxpayers are repaid these loans, the government plans on taxing the best-run financial institutions in America. It’s the government’s sorry version of the “circle of life,” where they give money to an incompetent, bankrupt auto company, turn over one-third of the stock to the labor unions and then get the largest banks in the country to repay the auto company’s debt. As Treasury Secretary Geithner said yesterday, “this tax makes economic sense to me.” Duh?!?! What am I missing here? Wall Street Debacle – Was It Really Greed? Time after time, I’ve read that the sole cause of the Wall Street debacle was greed. Perhaps that’s the instinctive explanation, but after reading numerous books on the subject, I’m not so sure that greed was the driving force. Clearly, greed led to Wall Street firms pushing to make the most money possible, but I doubt any of the players involved were hell-bent on making an enormous amount of money at the risk of destroying their companies. More than anything else, what I’ve read indicates that the big shots of these Wall Street firms were not very smart. Hopefully I can illustrate that point in this post. I’ve read extensively over the last several months on the subject of the economic crisis in America, including House of Cards: A Tale of Hubris and Wretched Excess on Wall Street, by William D. Cohan, The Sellout: How Three Decades of Wall Street Greed and Government Mismanagement Destroyed the Global Financial System, by Charles Gasparino, and Too Big to Fail: The Inside Story of How Wall Street and Washington Fought to Save the Financial System---and Themselves by Andrew Ross Sorkin. Most of my personal thoughts on the crisis crystallized after reading these books and the 1,500 pages regarding the financial crisis. Being an accountant by profession, I understood exactly how the implosion of these firms happened. After you break down the accounting necessary to get to why the firms failed, it’s fairly easy to see how their lack of liquidity made the major institutions blow up. However, I can’t see how people who were being compensated billions of dollars could’ve been so dumb. The only way to explain this matter is to illustrate to you how it occurred. About 15 years ago, the major brokerage houses found a lucrative market in taking loans that Freddie Mac and Fannie Mae originated. Essentially, they would bundle up thousands of mortgage real estate loans, split the bundle into manageable pieces, and sell the securities on Wall Street. At the time, it seemed like a good deal for everyone involved, and the brokerage houses would make a nice fee for their trouble in syndicating and finding buyers for the loans. In honesty, the fees were very modest, although the absolute dollars were huge. For example, if the firm only charged 1% to syndicate loans worth $400 billion, they would earn a fee of $4 billion, an enormous amount of money by any definition. The loans were also a very good deal for investors because they earned a higher rate of interest than typical securities, and the default rate on these securities were guaranteed by the U.S. government, making their loss rate virtually zero. This was quite a win-win situation for Freddie and Fannie since they could offload their mortgages and make new mortgages to promote new housing. Similarly, Wall Street could make a fee for the syndication of the underlying securities and investors made money on the interest rate. Unfortunately, a good idea often winds up becoming disastrous when taken to the next level. Wall Street was doing so well with the Freddie and Fannie loans that there ended up being a shortage of these loans for all the major brokerage houses to enjoy that success. The principal firms involved in this syndication were Bear Stearns and Lehman Brothers. Later on, it was Merrill Lynch, and to a lesser degree, other brokerage firms. After they could no longer find enough Freddie and Fannie mortgages to satisfy their desire for syndication, they began seeking out direct mortgage loans from the banks to syndicate. The major difference that most overlooked is that these loans directly from consumers did not have a government guarantee. Therefore, when a loan went bad in this investment pool, it truly went bad. The Wall Street brokerage firms were essentially agreeing with the banks to syndicate a few thousand of their real estate mortgages. They’d pick a group of mortgages where roughly 80% of the mortgage pool would be excellent loans, 10% would be loans to those with mediocre credit, and the remaining 10% would be sub-prime loans. If you place these loans on a spreadsheet, you would easily see that the likelihood of the collection of these loans in full would be great. There were only 10% sub-prime loans, and of that 10%, most of those loans would ultimately be repaid or refinanced. The 80% of prime loans would be repaid, so there would be little risk to the investors. Wall Street would take this pool of real estate mortgage loans over to their rating agency which would look at the spreadsheets and quickly assign an “investment grade” rating to the pool. As the brokers had done previously, they would then split up the pool of real estate mortgages into smaller pieces and sell them to the investing public. The only problem was that these mortgages weren’t like the Freddie and Fannie mortgages since when they started going bad, there was no implicit government guarantee to come to the rescue. As many of these mortgage holders found, it wasn’t long before the sub-prime loans quickly went bad. Even though the vast majority of the mortgage pool would be paying principal and interest on a regular and profitable basis, it would be a scary proposition for 10% to 15% of the entire pool to begin failing shortly after purchase. In addition, with real estate values dropping throughout the United States, the collateral obtained by foreclosing and reselling the houses made many more of the mortgages uncollectible. Even worse, many of the mortgage brokers throughout the United States were using exotic if not downright stupid mortgages to make more and more mortgage originations. You’ve probably read about the mortgages in California where the mortgagee was allowed to choose a payment plan. If they could not make the payment in full, the principal would be increased for the unpaid amount. That shortly led to mortgages that were significantly higher than the underlying value of the houses, which were also suffering from falling prices. The perfect storm of real estate mortgages was occurring. Accordingly, it also became fairly clear to the investing public that these mortgages were toxic. Why would you even buy a piece of a security where you had to worry about whether you could ultimately collect the principal? It simply did not make any sense for investors to invest in these securities even though the interest rates were higher. While it’s true that the interest rates carried a premium, the risk wasn’t worth the hassle to the investing public. Now you have the framework for where I believe sheer stupidity overtook greed by a long shot. To truly understand how incredible the situation is, you have to realize the magnitude in the business plan of these major brokerage groups. First, the underwriting group made profits off the underwriting of the securities and then there was the brokerage group that would make profits by selling these securities to the open public. The risk to the brokerage house was that they would agree to buy the underlying mortgages, but could they sell them to the general public? If they were not able to sell them to the open public, then they would just have to hold them on their books until a buyer was later found. During the height of the explosion in mortgage syndication, brokerage houses were seeking out more and more mortgages to syndicate. During 2005 and 2006 in particular, the mortgage originators in the country were making riskier loans at the insistence of the government in an effort to allow more people to become homeowners. I understand that it’s a worthy goal for everyone to own a home, but it’s not particularly bright to put people in homes that they ultimately can’t afford. As such, the Wall Street brokerage houses were syndicating more and more of these mortgages and attempting to sell them with the same success they’d had in selling the Freddie and Fannie backed mortgage pools. However, as previously documented, the public no longer wanted these mortgages. This is where you would think that common business sense would’ve overtaken the brokerage business. It should’ve been clear to any manager that even though enormous profits were being made on the syndication of the mortgages, the mortgages couldn’t be sold to the general public. This was only leading to a deeper and deeper hole. Rather than stop syndicating the mortgages due to their inability to sell the securities to the general public, the Wall Street firms just continued syndicating new mortgages at record pace. Even not-so-smart executives could see that they were loading up their own internal balance sheets with more of these mortgages that they’d just syndicated and made good fees on. Part of the problem was that all the major banks in New York were happy to lend billions and billions of dollars to these brokerage houses to fund their operations. Obviously it is much easier and more profitable to loan billions to one borrower rather than to loan $100,000 to a million borrowers. So, the cycle began. The mortgage loans were syndicated and the brokerage house made a nice fee. However, these loans couldn’t be sold to the general public and the brokerage houses were borrowing money from the other commercial banks in order to fund their operations. Given that the banks were borrowing money at very low interest rates and the mortgages carried rates at sometimes double their borrowing rate, the brokerage houses were pulled into a feeling of complacency that they were making a nice spread on the difference between the value of the mortgages and the value of their debt. They were so wrong! At the beginning of 2008, all of the major financial institutions were required to value their assets at what was called “mark to market.” Before, they were valueing their assets on their books using a hypothetical valuation, which Warren Buffett often called “mark to fantasy.” I’m not going to argue whether mark to market was correct. In fact, I’ve written in the past that mark to market was incorrect. A more viable alternative would’ve been the method that is being used today – “mark to model.” It’s not as strict as “mark to market,” but certainly not as liberal as “mark to fantasy.” Rather than throw around a bunch of terms, I’d like to give you an example. A brokerage house syndicates a pool of mortgage loans. Rather than use large numbers that no one understands, my example will use a $100,000 mortgage pool. Obviously, the amounts Wall Street would syndicate would be in the billions, not the thousands. The Wall Street investment group would buy the underlying mortgages from the originator for a fee of $98,000. They’d make $1,000 on syndicating the mortgage pool and the attorneys, accountants and other required professionals would make $1,000 as their fee to do the pool. At the end of the day, the mortgage house had $100,000 on their books available to sell to the general public. In better days, they would’ve sold these mortgages at book value or greater and the brokers working in the company would’ve made a commission plus a profit on the sale in the open market. Since the brokerage house didn’t have adequate equity to finance $100,000 in this mortgage pool, they’d go to their local banker and borrow 90% ($90,000). On the books of the brokerage house, they’d have $100,000 in mortgages earning 8% and a loan to their local bank at $90,000, on which they were only paying 4%. They were enjoying the ultimate 4% carry trade difference between their earning capacity and their cost of money until they could arrange for a sale to the general public. Since these assets were on the books of the brokerage house as inventory and available for sale on the open market, they were valued at cost on what they originally paid for them of $100,000. With the beginning of “mark to market” accounting, the dynamic suddenly changed. What is the value of an asset no one wants to purchase? Suddenly all the brokerage houses have literally billions of dollars on their books for these mortgages that the general public didn’t want to buy. What is even more interesting is the brokerage house should immediately quit syndication until they immediately caught up selling these assets. However, due to a lack of management, they did not quit. In fact, they accelerated syndicating the mortgages because of the enormous fees they’d make on the underwriting even though they couldn’t sell them to the public. Beginning in 2008, the brokerage houses were required to establish a fair market value on the underlying mortgage pool for the general public. Before the mortgages had been valued at $100,000, which of course, they owed $90,000 against. Beginning in 2008, since they were required to value these mortgages at fair market value when they had zero marketability, many of the mortgages were written down. At first, they were written down 30%, then 40%, and oftentimes, many of them were valued at 40% of face value. Even though the vast majority of these mortgages would be collected, since no one wanted to purchase them, they had to be valued at a significant discount – say 50%. The Wall Street brokerage houses suddenly had $100,000 on their books in mortgages that were valued at $50,000, yet they owed $90,000 on those mortgages. In an instant, they became insolvent and went totally “under water.” Even though it was clear that these mortgages were making every major brokerage firm write down their asset base, they continued to underwrite more and more mortgages, creating the real estate boom while destroying their own balance sheets. This insolvency overtook the financial framework of America very quickly. On March 5, 2008, the Bear Stearns Companies announced a profit of $115 million for the first quarter of 2008. In that press release, they documented that they had $17.3 billion in cash on hand and boasted that they had been a colossally profitable enterprise in the eighty-five years since its founding. Ten days after that announcement, Bear Stearns no longer existed. It was only the first of the major brokerage houses to meet such an untimely death. Interestingly, those who were hurt the most in the ultimate demise of these brokerage houses were the New York banks themselves. Poetic justice? They were loaning the money, funding the brokerage houses to make the loans, and the brokerage houses that took the losses and defaulted on the loans. It’s amazing how little Main Street was actually impacted at that time due to the Wall Street executives’ complete lack of intellect. It’s incredible that the executives of these firms were all so naïve that they couldn’t see this disaster on the horizon. Clearly, some major brokerage houses – in particular, Merrill Lynch – continued to syndicate these toxic mortgages long after there was absolutely no market for anyone to purchase them, losing 50% on every one that was syndicated. By virtue of realizing billions of dollars in profits during the “Go-Go Years” of 2003 through 2007, the executives on Wall Street accrued bonuses worth billions. The public is likely not aware of the fact, however, that virtually all of these bonuses were paid in the common stock of the companies. These executives felt invincible, and even though they were paid relatively modest salaries, most of their compensation was paid to them in the stock of their own companies. Due to the egos and company pride these executives developed the vast majority of them never sold their common stock. In fact, many of these executives were holding their common stock when the companies blew up right before their eyes. I’m not suggesting that any of us should feel sorry for these executives. I simply question that they acted in greed when they held onto their common stock even as their companies imploded around them. For example, James Cayne, Bear Stearns’ CEO from 1993 through 2008, had common stock in the company that was worth $1.7 billion in 2007. Shortly after Bear Stearns was sold to J.P. Morgan Chase & Company, Cayne sold all of his stock for $61 million. Obviously, $61 million is a large sum of money, but you must remember that this is the entire amount of his compensation for a lifetime of work in the company he practically built. Likewise, Richard S. Fuld, Jr., the last Chairman and CEO of Lehman Brothers Holdings, was never accused of being stupid. However, his lack of managerial ability forced Lehman Brothers into bankruptcy in September of 2008. At one time, Fuld’s stock ownership in Lehman Brothers had been valued in excess of $1 billion. Never in his long career had he ever sold even one share of his common stock in the company. When Lehman Brothers declared bankruptcy in September of 2008, he got exactly zero for his common stock. The press likes to talk about the sheer greed of these Wall Street executives. Rarely do you read that ultimately, the biggest executives never shared in those riches. Even though these men had taken these companies to lofty heights, they didn’t have the intellect or managerial ability to understand their own companies. Each sat by and watched as their company imploded and was essentially sold for pennies on the dollar. There’s no question that greed was a component in the failure on Wall Street. However, greed is a driving force in virtually all business endeavors. Whether or not you’re willing to admit it, why would someone be in a business venture if they did not strive to succeed? In my mind, the greed is an element of ambition. Of course, some of these executives retired from Wall Street with billions of dollars in their pockets, but just as many who got rich wound up virtually penniless. I intend to write further in an upcoming post on the compensation of bankers and the ridiculous new tax proposed by the Obama Administration. It puzzles me that a tax would be assessed on the 50 largest financial institutions to get back the TARP money. The banks have already paid back their government loans with interest. However, GM, Chrysler and AIG haven’t repaid their loans. Interestingly, those folks aren’t being taxed. Again, there will be more to come on this subject from me in the weeks ahead. Over the weekend I reviewed Rollins Financial’s performance on the 529 accounts we manage for our clients. If you’re not familiar with a 529 plan, now’s the time for you to bone up on the subject. In its simplest form, a 529 plan is a deferred educational trust you would set up for someone else’s benefit. For example, the plan could provide for the education of a child, grandchild, nieces or nephews, or anyone else you choose. For 2009, all of the 529 plans under our management had a total return of 24.52%. That’s an extraordinary return given that the gains on 529 accounts are entirely tax exempt if they are used for higher education expenses. Under U.S. tax laws, there aren’t many “free lunches.” This is an example of the best of both worlds – you provide for the cost of someone’s higher education while being tax exempt. If you use the income for the cost of higher education, the income earned is never taxed. The more I think about the ultimate benefits of a 529 plan, the more I think there is no reason why everyone reading this blog should not contribute to one. After all, almost everyone knows someone who could benefit from the educational money that these plans provide. The best way to fund a 529 plan is not with a large sum of money; rather, funding it through monthly contributions is more advantageous. The easiest way to accomplish this is by electronic transfer directly from a cash account you maintain into a 529 account that we would invest for you. This would provide you with the benefit of dollar cost averaging into investments and should be a very successful investment tool for providing for this future education expense. The other benefit of a 529 plan is that it is very flexible. Many people who are apprehensive about opening a 529 plan are worried that the person they’ve set it up for will not wind up not going to college or will receive a scholarship, rendering the funds unusable. 529 plans were designed to accommodate for these situations. For example, you can change the beneficiary on a 529 plan at any time. In other words, you can name someone else to be the beneficiary of the assets at any time. For example, if you have a child who decides not to attend college or if he or she has received a scholarship, you can change the beneficiary to be another of your children. You can continue changing the beneficiary to be another child if the funds continue to be unneeded. You could even change the beneficiary to one of your grandchildren if your family tree has continued to grow, but your children have not needed the funds you originally set up for them. There is one caveat for you to be aware of if you set up a 529 plan. It is not designed for secondary education; it is solely designed for higher education. Therefore, if you’re looking for a short-term fix for private education at the secondary level, a 529 plan will not work. A 529 plan is also an excellent estate planning vehicle. By virtue of transferring money out of your individual name into a 529 plan for someone else’s benefit, you have effectively transferred that money completely away from your estate. As long as someone else is named as the owner of the account, none of the assets (or the earned income) will be included in your gross estate for estate tax purposes. 529 plans work under the same gift tax laws as any gift to a third party. You can contribute $13,000 per year, per beneficiary to a 529 plan, gift tax free. If you are married, you and your spouse can contribute a total of $26,000 per year. For example, if you have total of 10 children and grandchildren, you can move $260,000 annually out of your estate and divided among the 10 different 529 plans you have set up. There are also complex tax rules that will allow you to contribute a high initial payment, but to keep from boring you too much, I will not explain those complicated tax laws herein. Another benefit of a 529 plan is that they work best over a long time horizon. If you establish a 529 plan for a newborn, you will have a full 18 years before you have to consider withdrawing the money for the child’s higher education. Additionally, even after beginning to take withdrawals from these plans, it is typically not all needed within the very first year, and therefore, it has even more time to accumulate value. The benefits of 529 plans are so convincing that I can’t imagine anyone not wanting to establish one of these plans. If you do not have children or if they are already beyond their college years, it’s still possible to set up a 529 for your grandchildren, nephews, nieces, or even a close family friend or other worthy recipient. In a worst case scenario, you can take money out of the 529 account for non-higher education expenses or just close the account. You will pay a 10% penalty plus state and federal income tax on the gains only, but the principal is completely exempt from taxes and penalties. In essence, it is basically equivalent to a Roth IRA for educational purposes only without the annual limits. It’s unlikely that anyone cannot afford at least $100 per month to contribute to one of these very valuable investment vehicles. I can think of nothing more valuable to a young person than to have their college education be provided for by someone so they do not have educational loans when they graduate. If you would like for us to help you establish a 529 plan, please contact us. Aside from our nominal management fees, there is no cost to establish or maintain a 529 plan. The above thoughts are not just my opinions – they are actually supported by facts. So, I must be right this time! When I graduated from college in the 1970’s, Japan was considered to be the new leader in global industrial production. I vividly remember that as part of my senior class at the University of Tennessee, I could pay extra to go to Japan and analyze their manufacturing process firsthand. Since it meant paying extra, I elected to go to Chattanooga. It found it extraordinary that a car could be built in Tokyo, shipped halfway around the world to Savannah, Georgia and subsequently trucked up to a dealership in Atlanta where it would be sold cheaper than you could buy a GM or Ford, which were manufacturer inside the perimeter. I always wondered how that was possible, but at that time, Japan was believed to be the most industrious and dynamic country for business in the world. As with all things that seem too good to be true, Japan’s stellar reputation was really just a case of a distortion of facts. During the great economic boom in the East, Japan was enjoying a currency advantage of a yen to dollar ratio of 300 to 1. During the 1980’s, as the yen continued to strengthen against the dollar, it wasn’t long before 100 to 1 yen was commonplace. During that time, we found out that the Japanese economy was, in fact, full of a lot of problems, many more than we ever believed to be true. And as of right now, the yen is at 93. In order to accommodate for the slowdown in production and the lack of exports due to the strong yen, Japan went on a binge of new debt. To shake their economy out of its doldrums, the Japanese cut their interest rates to essentially zero and began a massive spending program of government-sponsored stimulus plans. Sound familiar? Even with the enormous spending spree, Japan’s economy continued to be on the brink of a recession, and it has remained there for the last 20 years. In the 1970’s, the Nikkei 225 crested at over 40,000. As of today, that same index is valued at 10,681, going down a cool 75% in the intervening 35 years. As such, Japan is in the worst situation a country could financially be in. As of today, their government debt is a whopping 200% of their gross domestic product. They have dug such a deep hole of debt that their economy cannot grow due to all of the constraints and money necessary to fund their debt. My point isn’t to call attention to the evils of Japan’s economy. Rather, I want to give you some insight as to where the U.S. economy might be heading in the future. I don’t think it’s unrealistic to assume that the U.S. could find itself in Japan’s situation if it remains on its current path. During World War II, the United States’ debt to gross domestic product ratio was over 100%. Given the U.S.’s need to expand the war effort, it isn’t surprising to see that much debt in an economy that was completely slowed down by the Great Depression and World War II. However, immediately after the war, under the Truman administration, the debt began to fall precipitously. Even during the Kennedy and Johnson administrations in the 1960’s, when the war in Vietnam ensued, the U.S. debt was less than 50% of its gross domestic product, and the debts as a percentage of GDP didn’t get back to the 50% level until the end of the George H.W. Bush administration (which was during the Gulf War). At the start of the Clinton administration, the ratio fell markedly and only started to increase again in 2009. Our debts compared to our GDP are now increasing in staggering proportions. Last week, the committee responsible for our federal budget issued a report indicating that the total U.S. public debt had jumped to $7.6 trillion – or 53% of GDP – from $5.7 trillion – or 41% of GDP – in the last year. Furthermore, did you know that just days before this past Christmas, Congress agreed to extend the limit on our national debt to $14 trillion? This is an increase of $1.8 trillion – chump change to this Congress! Thank you, Congress, for the worst Christmas present to Americans ever. What is most interesting about this increase in national debt is that it really isn’t needed this year. 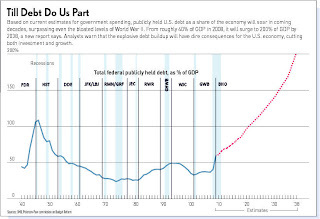 The national debt was increased in 2009 because they knew that it would be politically impossible to increase the debt during 2010 due to it being an election year. I noted with interest that the next vote to increase the national debt does not occur until after those elections in 2010. With the national debt growing at approximately $1.5 trillion annually, it now seems that Congress will have to increase it every year to keep up with their irresponsible spending. I hope that everyone is aware of how large the U.S. economy is at the current time. The U.S. GDP is now almost exactly $14 trillion. That is almost three times the size of any other country in the world. We have the largest economy ever recorded in world finance. Based on current government spending trends, the debt will continue to increase through 2018, at which time it will reach 85% of the GDP. In 2022, it will be 100%, and in 2038, it will reach 200%, at which point we will finally have outdone the Japanese. I couldn’t help but be amused when I recently heard certain Democrats say that President George W. Bush was “the most fiscally irresponsible president in history.” In the final year of the Bush administration, the deficit was approximately $800 billion. At the end of the first year of the Obama Administration, it’s at $1.4 trillion and is expected to be at $1.5 trillion next year. In just over 10 months, Congress has approved over $1 trillion in financial support for public service jobs, which incidentally, do nothing whatsoever to create new jobs in the private work sector. Even President Reagan’s deficits – when he cut income taxes by 50% – were always less than $200 billion per year and the public service national debt never exceeded 40.9% of GDP. In contrast, this year’s debt will hit 61% of GDP and will quickly move to 68% in the next fiscal year. A review of the following chart (which is obviously hypothetical beyond 2010) produced by the Peterson-Pew Commission on Budget Reform should leave you more than just a little scared. This chart assumes that spending will continue at its current rate. As should be clear to anyone, this massive amount of debt simply cannot be sustained. If we do nothing more over the next 10 months prior to the mid-term elections, we at least need to make sure that all of our Congressmen understand the importance of fiscal responsibility. Already, the amount of money necessary to fund the debt will hold back the growth in the U.S. economy until we finally stop it in its tracks. However, when the national debt is growing at $1.5 trillion, it’s not like we’re even close. It’s almost impossible to assume that you could increase taxes high enough to cover these tremendous deficits. It’s now estimated that tax rates would have to triple for every American paying taxes today to even get close to balancing the federal budget. I have no idea what Congress is thinking as it relates to these matters, but I can tell you almost assuredly that they are not thinking of this country’s best interests. During the last decade, we have had two pronounced recessions in the United States. It would be natural to assume that government has cut back on spending during these recessions to accommodate reduced revenue from taxes, and that government has reduced in size. Unfortunately, that is not the case. Total nominal federal spending has soared 97% – nearly 10% per year – over the last decade. During the corresponding same time, the economy has only grown at approximately 60%. You don’t need to be an economist to understand that the wealth of a nation is created by the private sector, not the public sector. Nevertheless, our public sector is growing at greater than 50% of our private sector. The White House now estimates that in 2019, the interest payments alone on the debt will be $774 billion. This is not a guess reported by Fox News; this estimate comes directly from the White House. That amount alone is greater than every item in the federal budget today except non-defense discretionary programs. I find that absolutely frightening. Those of you who know me well know that I am an optimist at heart. I can even find rays of sunshine in the projections I am relaying to you today. The current spending in Washington is so over-the-top and unnecessary that I believe it will only force reform. Obviously, reform will not be a result of my blog rants; it can only be achieved by eliminating the people who are currently in Congress. I get so tired of the hearing the talking heads say that we must spend a trillion dollars to fix the problems they inherited. That excuse doesn’t hold water anymore. The economy is now stabilized and doesn’t require or need this excessive spending. This past week, California demanded that the government give their state with an additional $10 billion in 2010 to finance their deficits. The major way the federal government could stop spending money today is by forcing states that have been fiscally irresponsible to pay their own way. It is completely obscene that the federal government turned over $80 billion to states to bail them out of their own poor decisions. Instead, they should immediately force the states to be financially responsible. Once the public finally sees the states performing massive lay-offs to finance their operations, those politicians will also be gone and new ones who are fiscally responsible will be elected. While it’s true that the states will have to terminate many employees, that’s the way it should be. If these people are good at what they do, they’ll find jobs in the private sector, which is where they should’ve been employed in the first place. We must immediately stop all of the ridiculous give-away programs related to foreclosed homes. The programs don’t work anyway and they are prolonging the recovery in the real estate world. But most importantly, these programs simply aren’t fair to you and me. Why should one homeowner receive financial relief from the government when the rest of us have had to make our mortgage payments? If we took the homes out of weak hands and put them into strong hands, we would be closer to an end in this real estate downturn than just in the middle. There’s a misperception in the national press that the number of households are somehow shrinking due to foreclosures. That’s ridiculous! There’s the same number of households today as there were last year, if not more, and these people still need homes to live in (although they probably can’t afford to own one right now). It’s perfectly fine for those who cannot afford to buy a home to rent one instead. After all, it worked fine for the first 234 years of this country. I don’t know what economic textbook Washington reads, but the new health care proposal only represents their lack of economic knowledge. Quite simply, the goal is to cover 35 million Americans who currently don’t have health care benefits. Additionally, the government is requiring the insurance companies to cover everyone regardless of pre-existing conditions or medical history. Most importantly, everyone’s health insurance will cost the same regardless of age, health conditions, and other environmental matters. With all of these new requirements for the insurance companies, the government says that the cost of medical insurance will decrease. If you try to teach that type of economics in college, even the students would laugh at you. The answer to economic expansion isn’t new governmental spending but less. The way to get the economy growing is to cut taxes, not raise them. I’ve been writing about that basic economic lesson for decades and not a single critic has been able to present a convincing argument to the contrary. The cost of government must go down dramatically. We must have national defense paid by the government, but virtually everything else is discretionary and needs to be dramatically reduced. Social Security could be made viable tomorrow by simply increasing the retirement age for everyone under the age of 35. I once heard Dr. Greenspan say that we could solve the Social Security problem in 10 minutes even with the first 8 minutes used for cordial greetings of the participants. That’s the one thing Dr. Greenspan said that is probably accurate. We’re not talking about reducing government spending by an extraordinary number. As I’ve demonstrated herein, it’s economically impossible for the U.S. to increase tax rates high enough to cover our deficits. Even if we did, the taxing burden to the economy would essentially shut down the U.S. economy for decades to come. The one and only solution to the deficit issue is to reduce federal spending. If we simply returned to the same governmental spending that was done during 2000, this goal would be accomplished. We need to eliminate the waste and political pork barrel from the government. This doesn’t seem like it would be that big of a burden to me. If reductions are made to the public sector, there’s no doubt that many of these employees will need to find jobs in the private sector. A lot of the funding for the arts, education and some frivolous programs would have to be paid for by the private sector. I believe that’s the way it should be anyway, as I can think of no justification for the federal government to take money from all of its citizens and use it for anything irresponsible. If the patrons of these programs love them so much, then they should fund and support them. If not, they shouldn’t survive. In short, in order to solve the financial problems of the United States, our federal and state governments must be forced to become more fiscally responsible. As President Obama said in 2006 at the Senate Debt-Ceiling Debate, when he was a first-term Senator, “Washington is shifting the burden of bad choices today onto the backs of our children and grandchildren. America has a debt problem and a failure of leadership. Americans deserve better.” Interestingly, that was also $2 trillion of new government debt ago – in less than four years. The foregoing are my opinions, thoughts, forecasts and projections. As always, I could be wrong. Think Health Insurance Is Expensive Now? Just Wait Until It’s Free! Those of you who regularly follow the Rollins Financial blogs are probably aware that I’ve taken a holiday from contributing posts over the past three months. This isn’t because I had nothing to report; rather, my editor/grammar police chief, Jennifer Wilcox, has been on maternity leave until today. Now that she’s back, I can finally give you my opinion on some of the hottest news topics. After the Standard & Poor’s Index of 500 Stocks was down close to 37% in 2008, who could’ve guessed that we’d see such a remarkable and positive turnaround in 2009? Not many people forecasted that the equity markets would turn on a dime in mid-March and that we would have such a massive rally in both stocks and bonds in 2009. That the financial markets have improved has been very comforting to investors as witnessed by the fact that attitudes have become somewhat more positive due to market improvements. There will likely be difficult days to come, but at least things are moving in the right direction. Over the next few weeks I will write more extensively on the economy and the prospects for a better economic life in 2010 and 2011, but I won’t bore you with those issues today. I have a lot to say about the new health care reform act passed by the Senate. While corruption in Congress isn’t exactly surprising, I can’t recall ever seeing such an important bill passed with such dishonesty, payoffs and abuse of political power. For instance, I’ll never understand how a provision was put into the bill for the federal government (read my lips – that means you and me) to pay 100% of Nebraska’s future Medicaid tab – in perpetuity. On another subject, I was encouraged to see the S&P Index up 26.5% for 2009. The other major market indices had great years, with the Dow Jones Industrial Average up 22.7% and the NASDAQ Composite up 45.3%. At the end of February 2009, all of these indexes were down in double-digits at 20% in losses, and the fact that they all had 20% positive returns is nothing short of spectacular. The portfolios under management at Rollins Financial also had an excellent year. Keep in mind that the percentages reported for the major market indices above are theoretical in that they do not include the cost of operations or expenses and they have constant money, which is to say that no money is going in or coming out as the year progresses. However, the calculation for our performance at Rollins Financial is not so simple. First, we have a broad range of clients age-wise – from the very young to the elderly. Additionally, we have a small cost associated with our business transactions. Because we compare our returns to the major market indices (which have no business transaction costs), we naturally assume that any investor would have a difficult time earning a rate of return equal to that of the major market indices. Furthermore, our accounts have a constant movement of funds – both in and out. I’m not making any excuses; I simply want to point out that when you compare rates of return, you must keep all of the facts in mind. The major difference between our accounts and the major market indices is the investment horizon of our clients. Our elderly clients have an entirely different financial requirement than do the very young who have a minimum of 30 or 40 years before they will need the money. For all of 2009, our average account under management generated a return of a little over 21.8%. While some of the accounts had a higher percentage and some of the accounts were lower, the fact that the average all accounts was at 21.8% is nothing short of extraordinary. 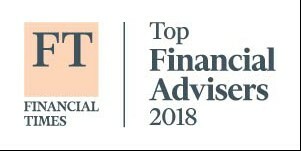 As we start to send out year-end portfolio summaries over the next few days, I hope you will take the time to evaluate what a remarkable financial turnaround we’ve had in 2009. Even with all the controversial items being reported by the press every day, I still think the future looks bright for 2010 and the U.S. economy. I see no waning of the explosive growth in Asia and Latin America, and I believe 2010 will be an excellent investing year even though it appears that the average investor is still not participating. It’s always been a mystery to me why investors tend to throw money at a strong stock market but refuse to invest when the markets are cheap. I’ve been begging my clients all year to make their IRA contributions and invest for their futures. Unfortunately, many investors missed a great market performance in 2009 by electing to sit in cash, which is essentially earning zero at this time. It’s truly amazing that the U.S. economy – after GDP losses in the 6% range at the beginning of 2009 – will likely end the year with two straight quarterly GDP gains. It appears that the final 3rd quarter GDP growth numbers will be in the 2.6% range, and I am projecting that the U.S.’s GDP for the 4th quarter will be in excess of 4%. It’s even more incredible that this turnaround in GDP growth was completed without the help of Congress’s so-called “Stimulus Act.” In fact, the bulk of the stimulus money will not be spent until the end of 2010, and by then, the economy will have recorded six straight quarters of positive GDP growth. This is yet another sign that your tax dollars are being misspent by Washington. The employment numbers for December will be announced at the end of this week. It’s highly likely that for the first month in many years we will have a positive employment growth. While the employment growth will be anemic, at least it will be positive. After all, unemployment can’t be reduced until Americans start being re-hired. It’s ironic to me that Congress is passing bill after bill that only discourages employers from hiring employees. I can think of no clearer example of this than the new health care reform act that was recently passed. If you look at every single poll on what Americans think is the most important issue, it’s employment. This is just another case in point of how Congress is totally out of touch with the desires of most Americans. In the coming weeks, I will write more extensively about the complete misuse of governmental funds in Washington, but I don’t want to bore you today with those facts. But I do want to give you one fact to contemplate: Over the last 12 months, more money was spent by your federal government than in the entire eight years of the Clinton Administration. To make matters worse, the federal budget for 2010 will be even higher than the amount spent in 2009. I’ve read extensively over the last several months on the subject of the economic crisis in America, including House of Cards: A Tale of Hubris and Wretched Excess on Wall Street by William D. Cohan, The Sellout: How Three Decades of Wall Street Greed and Government Mismanagement Destroyed the Global Financial System by Charles Gasparino, Dear Mr. Buffett: What an Investor Learns 1,269 Miles from Wall Street by Janet Tavakoli, and Too Big to Fail: The Inside Story of How Wall Street and Washington Fought to Save the Financial System---and Themselves by Andrew Ross Sorkin. I am directing your attention to these particular books because it’s probably unlikely that many people have gone through the trouble of reading these in-depth, exhaustive accounts of the economic crisis. What became clear to me after reading all of these books on the subject is that it crisis had a lot less to do with greed than with stupidity. It’s hard to fathom that people who were personally making literally billions of dollars could’ve exercised such incredibly poor judgment and intellect. In almost all of these cases, the people involved ended up with nothing. I think investors who try placing the blame of the financial crisis on greed need to understand that it was less of a motivating force than just bad business decisions. I wrote in my TARP – Bait and Switch? post that the TARP program wasn’t a bailout. Less than 18 months later, virtually all of the banks that were supposedly bailed out have repaid the government in full, with interest, and with additional incentives. But as I feared, the program no longer loans to banks; it loans to companies that will never repay the money. The TARP has been expanded to make ridiculous loans to General Motors, Federal National Mortgage Association (“Fannie Mae”) and the Federal Home Loan Mortgage Corporation (“Freddie Mac”). There’s no chance that these loans will ever be repaid, so kiss it goodbye. Additionally, the government is now using the money for another stimulus package that will not work and for foreclosure support that has no possible chance of working. What was once a well conceived plan to assist the banks through a difficult time was extraordinarily profitable for the federal government. However, it’s now turned into a governmental slush fund to distribute political paybacks. As if often the case with our government, a well conceived idea is quickly turning sour due to political interference. I read articles on an almost daily basis concerning the declining value of the dollar. The reason for the decline should be fairly clear – growth in other parts of the world is significantly higher than it is here in the United States. In any event, there is a byproduct of a lower dollar that receives little attention. Exports from the United States to the rest of the world are currently exploding. These exports are building jobs and helping to improve our economy. While a declining dollar can become detrimental, at the current time it is beneficial to us. I anticipate that the dollar’s decline will soon slow and at least stabilize against the rest of the world’s currencies. Of course we need to do significant work to reduce our federal deficits before the dollar will rally, but at least there is an end in sight. The coming years will not be without problems. The first problem on the list is the federal deficits, which are unsustainable, out of control and indicative of a completely irresponsible Washington. The deficits can only be addressed when new representatives are elected to Congress in 2010. I fully anticipate that unemployment will continue to be high and will probably be at 8% through the end of 2011. The high federal deficits and high unemployment will keep growth in the United States below par for at least a few more years. However, that doesn’t mean the stock market will go up. Taxes will soon be increased almost across the board. Almost everything the government is doing now to help a staggering economy is wrong. It’s interesting to note that the major tax to fund the Senate’s health care bill is almost totally focused on lower income individuals. For instance, there is a new 40% tax on “Cadillac” health care plans. Since almost all of these plans are sponsored by unions and governmental agencies, most of the tax will be passed along to the employees that have these plans. It’s estimated that 50% of these plans are maintained by employees that make less than $100,000 per year. Even though the concept was designed to tax the plans of wealthy bankers and Wall Street, it will actually only affect hardworking Americans who are struggling to get by already. Remember those promises last year that no one making below $250,000 annually would have their taxes increased? In short, these funds coming out of the economy will do nothing to increase its growth. Even though we are facing many negatives, it’s still quite remarkable to see the U.S. economy climb from the sharp deficits of 2008 and the first part of 2009. We are now seeing a sustainable positive GDP growth in the U.S., and while it’s certainly not robust, it is at least positive. As corporate profits rebound in 2010, stock prices will go up. I fully anticipate an investment year in 2010 that should generate 10% returns. If you have not invested recently, this is certainly a major disadvantage to your long-term financial goals. As always, the foregoing are my opinions, projections and personal biases. It is perfectly possible that I am wrong.